The manual is in good shape too but not fully finished, it should be there by the end of the week. - [NEW] Enhanced deep sleep with 0.1 mA consumption (12 months of shelf time with a 14500, 36 months with a 18650), no kill key really needed. - Up to 10 color profiles allowing the real time color change within a font. The use of a momentary is preferred as more natural to switch color, but I've added support for latching too. - changeable sound fonts, drop in support of CF/PC fonts, extra sound files are ignored. The Mute-on-the-go™ has become highly popular especially with saber classes (and was an idea and request from Novastar, for his saber & fencing lessons back in like 2007?). When implementing this, I left the power off sound playing to indicate the saber sound was still "ok", especially when it was being tested for a show. Well not really. Over the past years I've been fighting some lack of common sense with direct driven LEDs, in particular the fact most people don't measure their LED and don't calculate resistors and just expect it to work. Based on this, I tried to keep LED driving "reasonable" for beginners and rated the PRIZM (and NB) output up to 2A. Heck, as someone posted yesterday during this current discussion (pun intended), the plague "I just use 1ohm and it works" is still plastered everywhere on Facebook, so it's legitimate (IMO) to question this disinformation. Second, the driver part (that has been used for like 4 years now at least) has its maximum current rating at 6.5A and it's safe to use it 4A. Overall, if someone wanted to use a BBB tri-cree on a PRIZM, I would however suggest to maybe split the load between a BB pair and the last B die or even all split on the 3 channels but it should be fine to handle all 3 on a single channel. It's been a while since I wanted to harmonize the boards all together and it's been mentioned during the release of CF7. The real difficulty was finding a proper time slot to accommodate the board production (EU / USA), distribution (EU / USA) and overall growing demand (worldwide). While it's a cool update which brings the former super accurate motion detection brought to you via CF7 2 years and a half ago, I don't call it an innovation per say, and I'm happy to provide it to the whole range of board (planned for Pico Crumble too). It also brings a very good immunity to power supply noise and infamous errant swings, but this shouldn't be an excuse for not measuring your leds nor verifying what your battery drain is (and not just from the "datasheet"). To be noted that some manufacturers use binning for both voltage and hue and reading the bin code is much more accurate than just using the typical value from the datasheet (which is just a ballpark). The motion detection uses the simplified parameters from CF, a motion "gate" that we usually set between 50 and 70 (not critical), no more general sensitivity to mess up with, and a swing threshold separated from the clash threshold. I've been using our former multi-saber wireless stage performance system for some year with Saberproject and during the period they designed their own wireless transmitter, I worked with them to enhanced the possibilities of wireless live performance with lightsabers. This has been achieved in the Crystal Focus firmware and is now progressively ported to other boards. How does it work ? Basically, as I consider trying to stream the sensor or the digital audio from the saber is a bad idea (mainly for latency issues but not only), I rather chose (in 2006) to send saber actions to the computer to control a polyphonic sampler. I'm currently working on my new omnisaber "dongle" to revive both hardware and software initially designed 10 years ago but in the meanwhile, I'm ensuring the new gen of boards can be "omnisabers-ready". The saber actions are exported on the board serial port / RICE port, just like any of the diagnostic information and remote configuration. The NB allows to drive a WS2812 (and compatible) blade up to 150 pixels. The strip data line is handled by the pad L3 when the board is configured for using a ledstrip. We spend quite some time to build a neopixel driver that uses zero CPU along with an abstraction layer in the firmware so that the blade output / update is not different between high-power LEDs and a strip. That means the strip gets the same exact refresh rate, flicker look & feel. The driver has also adjustable timings, as some compatible pixels use a different chip (APA106, SK6812) have different timings, we therefore provide adjustable params in the override.txt file to define the strip protocol timing with a resolution of 25.2 nanosecond. The board *addresses* 150 pixels max. With 2 strips you could have 300 leds. So yes you can wire 3 strips NP. The current is crazy and there's more shadowing than expected but it's been tested by Alex Gordon. I think you all got the point, I tried to separate the question of the addressed pixels vs the total number of pixels in the blade, which are 2 different things. * To be noted that one significant difference between high-power LEDs and a LED strip when using the FlexiBlend™ engine is that the latter has a 10 bit resolution (0-1023) to define color with a significantly high resolution (billions of colors). The strip uses only 8 bits to define color, therefore there's a much more noticeable quantification (ie "step") effect on smooth effects like pulse. Conversely, subtle effects like shy flicker become less visible or "obvious" due to the lower resolution of the strip. As a result, certain effects will need to be exagerated when using a ledstrip. Color remains defined on 10 bit just like our other direct drive boards however expect no visible color change by tuning channels with only 1 or 2 steps. The strip resolution being 4 times lower, steps of 4 are required to obtain a color change on the strip. For Pulse Fx (now on NB too) afficionados, the low brightness side of the ledstrip is also 4 times less smoother, hence digging too hard with the flicker depth will produce some stepped flicker. A depth of about 60-70% remains ok to the look (basically avoid the lower quarter). In the global effort to reduce the need of a kill-key (would it be during a convention or for some shelf time) we wanted to preserve our super efficient deep-sleep mode that uses only 0.1mA of current, and which allow more than 1 year of shelf time with a charged 18650 (tested). The pixel chips use some current even when off, about .9mA each. With a trimmed blade using for instance 2 strips of 140 pixels, we have a good 250mA of current draw when the blade is off, which we found ridiculous to not address for deep-sleep. As a result, we provide a "remote power control" over the strip by hooking the strip(s) negative to 2 of the on-board LED drivers (aka on-board PEx). Both channel 1 and 2 are enabled at the same time to split the load of the strip when the blade is on. Once the blade goes off, channel 1 and 2 will keep providing the idle current to the blade until deep-sleep is reached, then the blade will be disconnected. 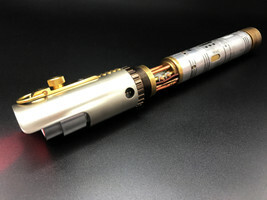 * Obviously, a more radical solution is always possible, by removing the blade from the emitter socket to prevent any current to be used, however it's great for component blade sabers to stay with their blade in and secured when used often, especially for duelling (the blade being heavier) and we think it's great to have such a saber always ready to strike without disassembling it just for the sake to save on runtime when there's a smarter way to do it. For Prizm we had the room to implement a specific data line output to control the ledstrip. As required per the datasheet, a resistor is required between the output of the controller (sound board) and the strip to reducing ringing and keep the signal with clean edges & states. We added a 0603 footprint on the board to include the resistor on-board and save space in the hilt. The resistor is preferred to be "as close as possible" from the strip but it's definitely not critical with the scale of a saber hilt and we experienced no issue with on-board + 20cm of wires or thru-hole resistor next to the strip. Based on our former CF-LS design, we combine a spatial scrolling with the fade effect of the high-power LED for a more dramatic scrolling effect. Two parameters lsfadeon and lsfadeoff define if you use the fade effect during ignition or retraction. I've also added a parameter called lightstick that illuminates the blade all the pixels at once (no spatial scrolling) and which can be combined with the lsfadeon and lsfadeoff parameters. That feature might sound a little "off" compared to the lightsaber but can be useful for some other pikes or staff, and I got a few request in the past for my electronics to go in devil sticks for instance. using the quick-on / quick-off parameters in the configuration file. - It replicates the blade energy alteration due the impact. It's not a random chopped-slice/segment of blade that changes of color, but it has smooth edges with a brighter central spot where the impact is. - It progressively returns to the blade color in a realistic "temperature effect". Think hot metal hue changing when you watch a blacksmith hitting glowing metal on an anvil. These upgraded boards are looking fantastic Erv, thank you so much for all your hard work! Accubolt and Multibolt looks amazing on the demo. Seriously can't wait until the blades start getting produced!!! Is there any info for the ETA at TCSS? "In the Light, I have Balance. In the Darkness, I am Free"
It has passed all beta testing now and will be shipping probably tomorrow so I would say first part of next week. Awesome, I cannot wait to try out the new v5. Erv, i have seen some info on a possible V5.1 version but without any log. Board seems smaller not just in heigh (yellow piece) but in width, is that true, would it still fit current chassis for V4? Seems also that it has a new firmware? about to announce this, indeed, that's the narrow prizm 5.1, 20.3mm wide and slightly shorter as well. Fits 7/8"
Any word on when TCSS will have more 5.0 or 5.1 to buy? Either Friday or Monday. I am sending out boards today.